"Trau'ug. In your tongue its meaning is something akin to 'less talk, more action.'" 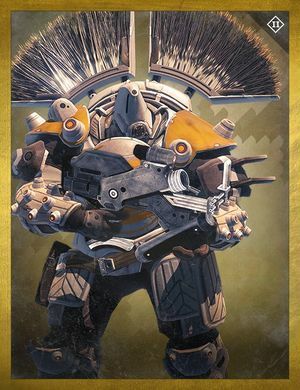 Valus Trau'ug is a Cabal Centurion found in the Prison of Elders and commander of a renegade group called the Broken Legion. Trau'ug had requested permission from the Cabal high command to attack the Reef, but was denied. Impatient with their perceived weakness, he and his soldiers murdered his officers and went AWOL, attacking the Reef. They were captured all the same. How the Reef Awoken defeated Trau'ug is not known and Variks skirts the issue when pressed but Trau'ug's bloodlust and mastery of wartime stratagem is intact within the Prison. Using his battle-tested Cabal field techniques, the "Broken Legion" crush any who dare accept Trau'ug's challenge. His custom-rigged shield randomizes that keeps attackers off guard as he presses every advantage. He has a special ability where every ten seconds after his shield is disabled, his shield regenerates to a new elemental type. Trau'ug's shield ability is somewhat similar to Val Aru'un's. Due to his colors, Trau'ug may have once been part of the Blind Legion.